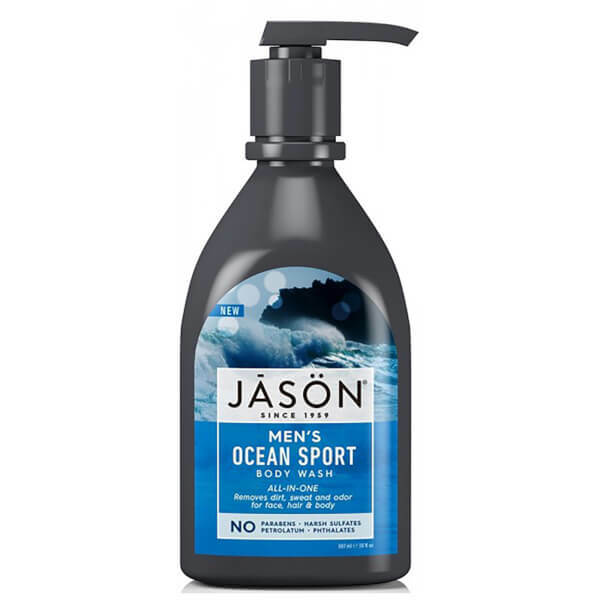 Feel invigorated from head to toe with the JASON Men's Ocean Sport Body Wash; a revitalising, all-in-one formula for the face, body and hair. Powered by Aloe Vera and Algae Extract, the deep cleansing shower gel effectively eliminates dirt, sweat and odours to leave you feeling refreshed around the clock. Infused with a masculine scent of Citrus, Patchouli and Vanilla. Housed in a pump bottle for convenient use. Free from parabens, phthalates, sulphates and petrolatum. Use on damp skin and wet skin in the bath or shower. Massage into a soft, soothing lather, then rinse with warm water. Aqua (Water), Aloe Barbadensis Leaf Juice(1), Sodium Laurylglucosides Hydroxypropylsulfonate, Sodium Cocoyl Isethionate, Glycerin, Cetyl Alcohol, Xanthan Gum, Citrus Aurantium Dulcis (Orange) Peel Oil, Citrus Limon (Lemon) Peel Oil, Juniperus Virginiana Oil, Lavendula Hybrida Oil, Ricinus Communis (Castor) Seed Oil, Citrus Aurantinum Dulcis (Orange) Fruit Extract, Humulus Lupulus (Hops) Extract, Macrocystis Pyrifera Extract, Caprylic/Capric Triglyceride, Citric Acid, Coco-Glucoside, Glyceryl Oleate, Sodium Chloride, Phenoxyethanol, Potassium Sorbate, Sodium Benzoate, Amyl Cinnamal, Limonene, Linalool.